I’ve visited about 50 schools up and down the state so far this year. It’s the best part of my job when I get to speak with our members — and sometimes their students — and learn why it is our folks move education forward in Delaware. I sometimes will take pictures when I’m visiting a school or learning more about a program. I believe with every ounce of my being that the good things public education is doing for students across our state far outweighs the negative perceptions so many have of our public schools. This picture struck me when I entered an English classroom at a high school in New Castle County a few months ago. And the story behind it will stick with me forever. I asked the teacher where this huge drawing on a whiteboard had come from. He shared with me that it was about two years old. A former student of his — a withdrawn senior who rarely ever spoke to the teacher — did it. The teacher said it was near the end of the year, the student had shown little effort, and at a certain point, there seemed to be a level of tension the teacher wished could be resolved. Eventually, the teacher said to the student “I’ve failed you. You’ve gotten through this entire school year and you’ve barely said two words to me. I’ve failed you and for that I am sorry.” The teacher left the room, upset, not knowing what to do for this student who had been withdrawn for so much of the year. Come to find out, the student had some language barriers as well as some issues at home that were causing her to withdraw. 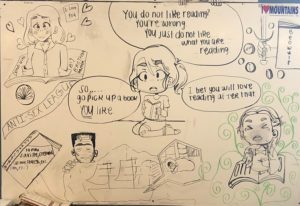 The teacher was out of the room for a period of time and when he came back, this beautiful drawing — representing all of the pieces of literature covered in senior year — was on his whiteboard. The teacher became so overwhelmed and emotional at this display. He told me that the young lady — though barely communicative — was obviously absorbing the literature the class was reading that year. The teacher memorialized this art by spreading a thin film over the drawing to protect it and it remains in his classroom to this day — a testament and clear sign that he, in fact — was not a failure to this particular student. How many stories like this are waiting to be told around Delaware? Great post Mike. I was never a teacher, but as a parent, I can certainly relate to this teacher’s feelings .